In these troubled times you may feel that the apocalypse looms and your choices are meaningless. True! But you do have a choice of apocalypse. 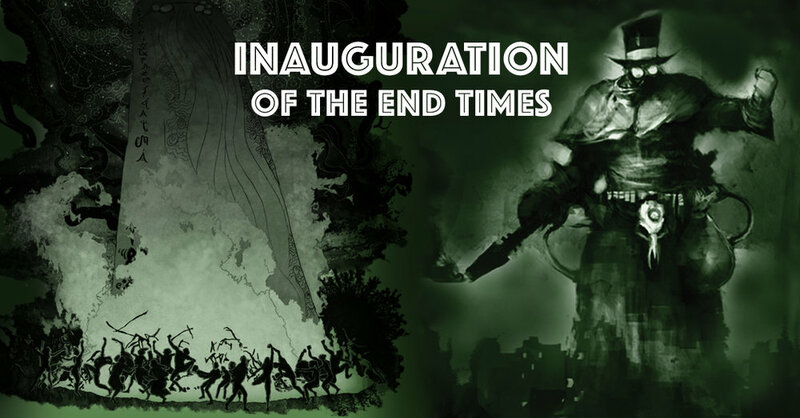 In honor of this week's dubious rituals and ceremonies, Strix Publishing is offering you your choice of end times with discounted bundles of the Lovecraftian horror of The Book of Starry Wisdom and the neo-Victorian zombie nightmare of Unhallowed Metropolis. Unhallowed Metropolis bundles are available now. Choose a soot-choked future where the dead rise, the government conducts brutal quarantines, and the wonders of aetheric technology cannot save you from the ever-encroaching blight. Enter the world of Unhallowed Metropolis, the gas-mask chic role-playing game of neo-Victorian horror. The Book of Starry Wisdom book + map bundle is available now. Choose an examination of the Cult of Cthulhu in the words of H.P. Lovecraft and a host of contemporary authors, bound in faux-green hide, and accompanied by a beautiful map that will show you the way to the last city; R'lyeh, and He Who Lies Dreaming of a time when the puny apes will be wiped clean from the face of His world. The Book of Starry Wisdom beckons you to turn its pages as the stars come right. Use code: ENDTIMES for 10% off your entire order. Your choice may not matter, but you'll be entertained nonetheless! We are pleased to announce the launch of APOCRYPHA: The Art of Jason Soles today on Kickstarter. Jason Soles is best known as the lead developer and designer of Privateer Press' award-winning miniatures war-games, WARMACHINE and HORDES, but he is also an accomplished and renowned sculptor. For almost two decades Soles has produced an array of unsettling works in a variety of mediums. APOCRYPHA: The Art of Jason Soles collects hundreds of photos of his works for the first time. This premium edition art book is 9 x 12", approximately 125 pages, features a beautiful matte hardcover with spot gloss treatments, and is bound with Smyth sewn binding allowing it to be opened and lain flat to fully display its full color photographs. Created in collaboration with Strix Publishing, and including a foreword by noted artist George Higham, this book will be a stunning addition to the collection of any connoisseur of the dark arts. A number of rewards, including some hand-cast in bronze by Soles himself, are available as rewards. We are excited to announce the launch of the official Problem Glyphs art book on Kickstarter. The Problem Glyphs art book contains 100 glyphs and their associated submissions, accompanied by an introduction by Eliza Gauger and a foreword by award-winning writer, Warren Ellis. Problem Glyphs will be a premium edition, display-worthy art book, measuring 10x12" and featuring a Smyth sewn, genuine clothbound hard cover with gold foil-stamped cover illustrations. The estimated 220 interior pages will be printed on beautiful matte coated art paper. Tremendous care has gone into every aspect of the book, from its binding to its typography, the beautiful and storied Doves Type. In support of the Problem Glyphs art book, a Kickstarter-exclusive glyph, [WILD HUNT], has been created. Once this Kickstarter and the post-campaign pledge manager end, this glyph will never again be available. This print will be offered as a limited edition 8x10" giclée, numbered to match the final quantity produced for backers. Each print will be personally signed in irreproducible gold ink by Eliza Gauger. Thank you for your support of both this project and Strix Publishing! One of the foundational ideas behind Strix Publishing is that a book is more than a collection of words and images. With the advent of digital publishing, the idea of book-as-artifact is more precious than ever, and Strix’s function is to create premium edition books acting as vessels that do their contents justice. This is not so say we’re Luddites, though. We do not disavow digital editions of books—they’re a tremendous boon to publishers and readers alike and represent an important step in the democratization of knowledge and art. Almost all Strix print publications will be accompanied by eBook editions, but physical books are the focus of our attentions. The initial slate of publications for Strix’s 2016 catalogue, beginning with the Problem Glyphs art book, were all solicited due to how well they lend themselves to unique and beautiful print editions. Problem Glyphs will be a premium edition and display-worthy art book featuring a Smyth sewn genuine clothbound hard cover with gold foil-stamped cover illustrations. The estimated 220 interior pages will be printed on beautiful matte coated art paper. Tremendous care has gone into every aspect of the book, from its binding to its typography. In the case of this edition, typographical choices were made in close consultation with Problem Glyphs creator, Eliza Gauger. We’ll have more to share on this subject soon. In the meantime, we’re very excited to share this 3D mockup of the Problem Glyphs art book, and are looking forward to see you all in the comments of the Kickstarter, beginning May 16th. ...I bid my hideous progeny go forth and prosper. By way of introduction, I'm Simon Berman, owner and operator of Strix Publishing. Strix is the natural product of my career after nearly a decade of work in traditional games publishing. Over the past years I've had the pleasure of collaborating with countless talented writers, artists, and editors. These creators come from diverse backgrounds and disciplines, but they all possess unique visions, compelling voices, and formidable expertise. Strix is a platform to share their work in ways that truly do them justice. The first offering from Strix will be The Book of Starry Wisdom. This book was successfully crowd-funded in 2015, is currently available for pre-order, and will be available for general purchase summer of 2016. ’Starry Wisdom arose from my desire to see the works of H.P. Lovecraft in a print edition that would provide the reader with the experience of perusing a tome of forgotten lore, accompanied by maps, illustrations, and essays that abrade the lines between fictional story and factual history. Bound in faux-leather, this volume will be immersive and worthy of being shelved alongside the Necronomicon itself. The success of The Book of Starry Wisdom made it clear there is a readership hungry for the physical experience of holding a book, even in the face of the conveniences of digital editions. While Strix publications will typically be accompanied by e-books they are not the primary focus. Book-as-artifact, worthy of display and space on a bookshelf is the imperative. While Strix is in many ways a traditional publishing house in that it produces physical books, I am applying lessons learned over the past years to a somewhat unusual business model. Traditionally, small press publishers have struggled to pay their bills, let alone their contributors. Small presses who have persevered in these difficult conditions – to not only produce high quality works but to pay their contributors worthwhile fees – have earned my utmost respect. Silvia Moreno-Garcia's Innsmouth Free Press has been a source of inspiration to me, as have her well-run Indiegogo campaigns in support of IFP's books. Beginning in May, Strix will orchestrate four Kickstarter campaigns for upcoming books. Anyone familiar with Kickstarter and crowdfunding will no doubt consider this an aggressive schedule, and they are quite right. Kickstarters are time-consuming marketing campaigns in and of themselves, to say nothing of the work of actually producing the books! That said, it is precisely the nature of Kickstarter that makes this a viable strategy. Were I to seek funds through traditional investment methods, Strix would be beholden to a much lengthier process and, likely, not be able to fairly compensate my trusted editors, graphic designers, and illustrators. While I'm the only staff member of Strix, a crew of extraordinarily talented freelancers assist me. This also means that even as The Book of Starry Wisdom prepares to go to press the next three books are deep into pre-press production and should be able to go to press themselves in short order. As well, crowdfunding allows a publisher the flexibility to get creative. Things like art prints, alternate covers, ribbon bookmarks, and numerous other luxury enhancements can be quoted and then applied to a print run if a funding goal is exceeded. In some cases, the upcoming books from Strix are natural candidates to be accompanied by peripheral items like sculptures or other physical objects that relate directly to their content. Kickstarter allows Strix to not just produce books, but entire immersive experiences. Not all Strix publications will be crowdfunded. In time, I hope to have the debt-free capital necessary to produce some books in more traditional ways, as well as offering some fiction free to anyone who wishes to visit the site. With that out of the way, I'm pleased to announce the first books of the Strix Publishing 2016 schedule. On May 16th, Eliza Gauger's ongoing Problem Glyphs project will launch on Kickstarter to become Strix's first art book. Problem Glyphs has been the subject of Gauger's attention for over two years. Individuals anonymously submit their deepest, darkest problems for which Gauger creates symbolic illustrations informed by her background in fine art, mythology, and the occult. The Problem Glyphs art book contains 100 submissions and glyphs, accompanied by an introduction by Gauger. This will be a premium cloth-bound hardcover book featuring a number of luxurious enhancements. The Kickstarter will also give backers access to art prints and other exclusive rewards. Molly Crabapple— "Eliza Gauger's problem glyphs take crowdsourced agonies and crystallize them into symbols. In the beginning, art was inseparable from magic, and Gauger returns it to its roots, in a twist updated to the pace, needs, and logic of the network." Warren Ellis— "Sometimes you don't fully understand your fears and ghosts until they're put in front of you, so you can exorcise them. It's a spiky, painful thing. Problem Glyphs are spiky, painful things. That's why they were, and are, needed by so many people." Neil Gaiman— "I think it's a beautiful way of talking about problems, empowering people, and letting the magic of art happen in their lives." June 27th will see the launch of a Kickstarter for the collector's edition art book, APOCRYPHA: The Art of Jason Soles. Jason Soles is best known as the lead developer of Privateer Press' award-winning miniatures war-games, WARMACHINE and HORDES, but he is also an accomplished and renowned sculptor. For almost two decades Soles has produced an array of unsettling works in a variety of mediums. APOCRYPHA: The Art of Jason Soles collects hundreds of photos of his works for the first time. Kickstarter backers will have the opportunity to receive original sculptures by Soles, in addition to the art book itself. In August, author Orrin Grey's first fiction collection, Never Bet the Devil & Other Warnings, will launch on Kickstarter. Having fallen out of print in 2015, this second edition will include all new illustrations and at least one all new story, "Goblins." More details about this book and on the Kickstarter campaign will be forthcoming later in the spring. "The stories of Orrin Grey are fun, fast, and, surprising enough in a genre where doom, gloom, and ultra-gore are standard issue, rather good-natured. It's not often you come across 'pleasant horror,' but that's the best way to describe this collection—put a load of classic horror movies and comic books in a blender, liberally add some splashes of Mike Mignola-cool, and you've got yourself a monster mash to be reckoned with." October will see the launch of a companion volume to The Book of Starry Wisdom, illustrated by renowned artist, Valerie Herron. Details on this book will be announced this summer. If you’ve read this far it’s likely because you’re already a fan of Strix by way of The Book of Starry Wisdom, or you made it here as an enthusiast of one of the projects announced above. However you got here, thank you so much for your time and support and I hope that all the projects I have in the works—way into 2018!—are going to intrigue, horrify, and entertain you.